The post Treating Separation Anxiety in Dogs by Victoria Stilwell appeared first on Dogster. Copying over entire articles infringes on copyright laws. You may not be aware of it, but all of these articles were assigned, contracted and paid for, so they aren’t considered public domain. However, we appreciate that you like the article and would love it if you continued sharing just the first paragraph of an article, then linking out to the rest of the piece on Dogster.com. Dogs, like people, have a mutual need to form social attachments, and while many dogs don’t like being alone, most learn to cope by themselves for short periods of time. Some dogs, however, become very anxious and distressed when left alone, and may bark, whine, pace restlessly, pant excessively or become very destructive. Let’s look at separation anxiety in dogs and treating separation anxiety in dogs. First, what is separation anxiety in dogs? What are the signs of separation anxiety in dogs? Photography ©stephanie phillips | Getty Images. Before discussing treating separation anxiety in dogs, let’s talk about what separation anxiety in dogs is. If your dog shows any of these behaviors just before and after you leave, she might be suffering from what is known as Separation Anxiety (SA). It’s one of the most difficult behavior problems to work with because successful modification relies on you or other family members being present at all times during what can be a long teaching process. SA has many causes, but it is believed that genetics and/or an early history of abandonment, contributes to what quickly becomes a deeply rooted problem that is highly resistant to change. What are some specific symptoms of separation anxiety in dogs? 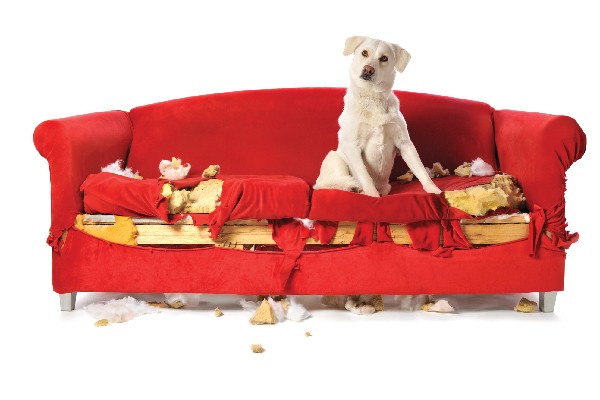 Dogs who suffer with SA usually display anything from minor to major destruction when left alone. This destruction is normally focused on exit points, such as doors and windows, or places and objects that are more intimately associated with a beloved family member, such as shoes, the bed or the sofa. Chewing relieves stress by releasing endorphins into the dog’s body, just as a person might release tension by biting their nails. The most intense time for SA dogs occurs within the first 30 minutes of a person’s departure and, in addition to the stress-related behaviors mentioned above, dogs might also drool, vomit, eat through walls or jump through windows to escape and re-establish contact with their families. These behaviors can also occur with varying levels of intensity until the person returns. Treating separation anxiety in dogs depends on the severity of the disorder and must be tackled on many levels. First and foremost, anxious dogs require appropriate exercise, which helps modulate emotional responses by releasing mood-enhancing chemicals into the body. Boredom and inactivity contributes to SA, but daily exercise along with mental enrichment can enhance your dog’s life considerably. Most SA dogs become very aware of their person’s departure behavior, and normal habitual actions, such as putting on a coat or picking up keys, can trigger feelings of anxiety and panic. Masking these triggers by hiding your keys in a different place, using a different bag and going out through a different door can help, but dogs quickly become wise to alternate departure cues. Now is the time to change your dog’s expectations. What door do you normally walk out of when you’re leaving for a period of time? Try changing up your departure cues by putting on your coat, and go and sit on your sofa instead of walking out the front door. Pick up your keys and go into the kitchen to wash the dishes. When you do leave, close the departure door and immediately come back inside. Keep repeating these exercises to vary your departure cues and other behavioral habits. Repeat these exercises over a number of days until your cues and departures no longer trigger a negative response. Time spent away can be gradually increased until your dog is confident that you will return. Make your comings and goings a little less emotional. Dogs are sensitive to changes in their environment, and transitioning from noise and energy when you are present to silence in the home when you leave, adds to a dog’s panic and feelings of abandonment. Make the transition easier by leaving some lights and a television on before you go, or play some calming music while you are away. Leave your dog with an appropriate activity toy to chew on. 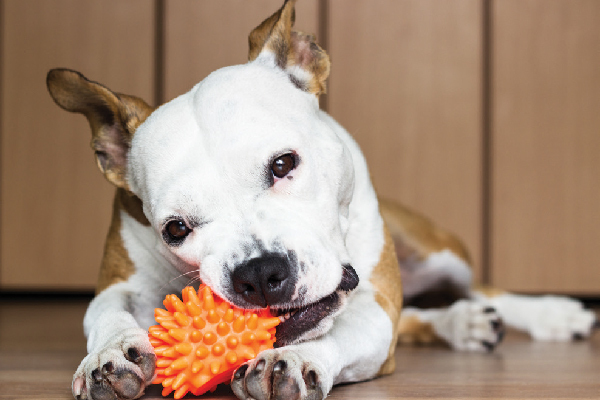 If your dog is too anxious to eat or play with a toy when you are away, introduce her favorite toys and/or chews while you are relaxing at home so that you build up a positive emotion around that particular toy. You can use toys only when you have worked to the point where your dog can be alone for about five minutes. Separation anxiety is one of the main reasons why dogs are relinquished to shelters every year. Before treating separation anxiety in dogs, make sure your dog is truly anxious and not destroying your home or barking because she is bored. Use a webcam to record and monitor her behavior when alone. If you do suspect SA, consult with your veterinarian to make sure there is no medical cause for your dog’s behavior and then contact a certified positive trainer or vet behaviorist to help make a treatment plan. Go to postively.com/trainers to find a trainer in your area or to utilize a new and effective way of modifying SA through a virtual consult with a separation anxiety certified professional.